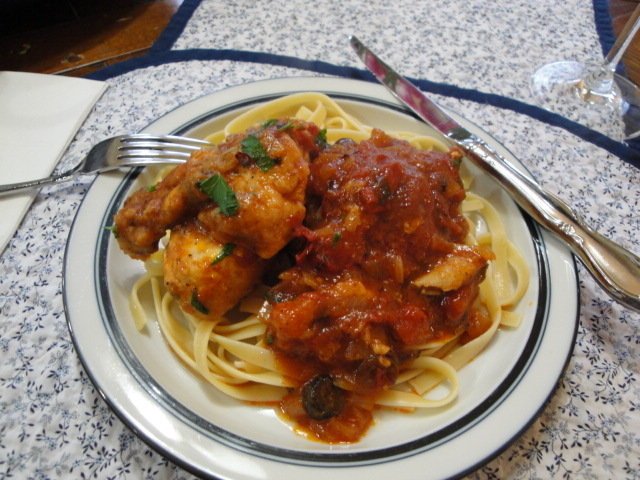 Whenever I pose the question to my husband is there anything you’re craving, the response nine times out of ten will be Chicken Cacciatore. It’s a dish we’ve been making for nearly as long as we’ve been together. It has a form of fried chicken as it’s base, so totally in my wheelhouse since the age of 9 or so. 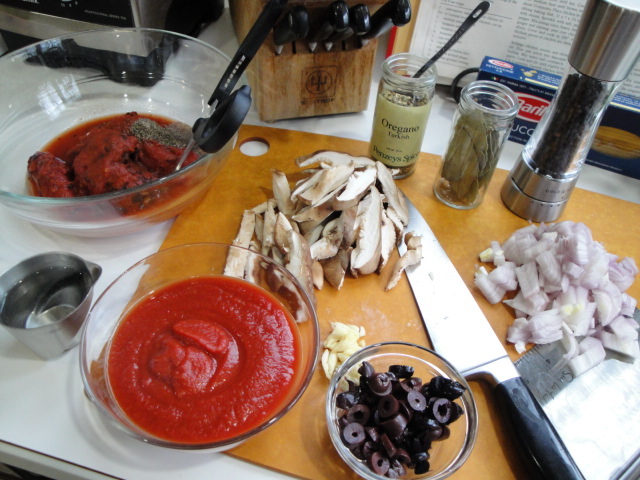 It’s saucy, one of the base criteria for a great dish in my husband’s mind. Last but certainly not least is that it’s even better as leftovers than it is when freshly made. So even if you are cooking for two make the entire recipe! The other cool thing is that if you choose to make it with a whole chicken, you will have the makings for some great chicken noodle soup as well. 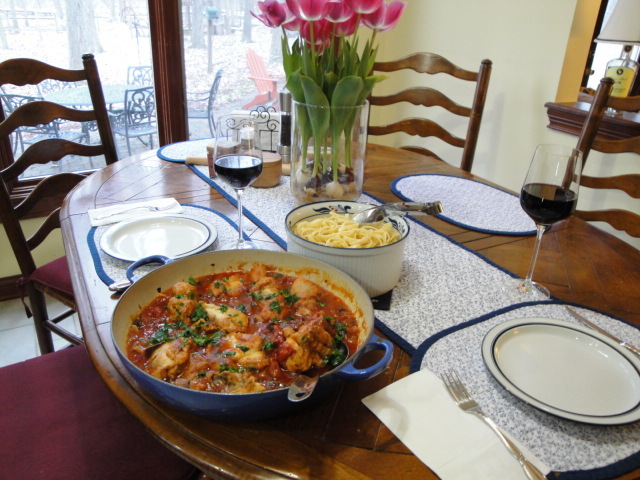 Over the years I’ve tried numerous variations, all tasty, but when it comes right down to it, our favorite is based on the one we discovered so many years ago in the Betty Crocker’s International Cookbook. As with most of the recipes we’ve made from this gem of a cookbook it has ingredients that are and have been readily available in nearly every grocery store across the country since it was published in 1980. 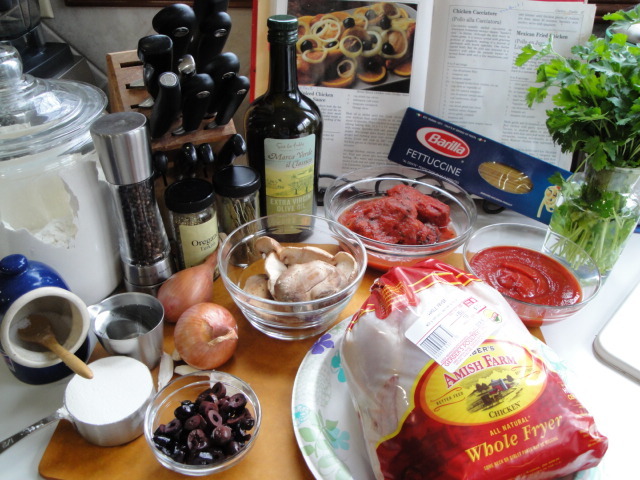 Yet, somehow each recipe seems to remain true to the spirit and flavor of it’s origins. We made it for the couple who were to become my in-laws in Montevideo MN on the evening before we announced our engagement. And believe me Montevideo was not the culinary capital of the US either then or now. I’ve made this dish so many times, it now pretty much falls into one of those “cooking without a recipe recipes ” and can vary slightly depending on the ingredients I have on hand i.e. what’s in the garden, refrigerator and pantry. However, for this post I’ll go back to the original and recreate it as written* and leave it to you to make it your own with the ingredients you have and your inspiration. The next time it hits our table I’ll post it with the minor changes I’ve been making over the years that were never recorded. 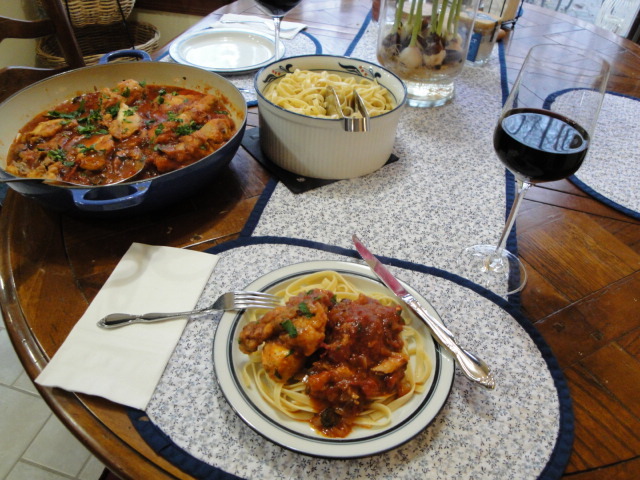 For example it could use a bit more sauce and the addition of some wine is not without merit! However, the original that I give you here is pretty darn tasty just as it was back in 1980. All of these are going in at once, so just put them in a bowl and set aside. 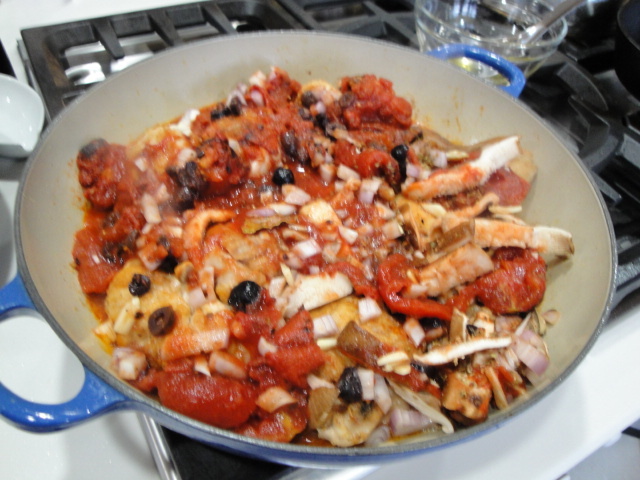 A little unusual not to sauté the onion,garlic and mushrooms before adding the tomatoes but it works! 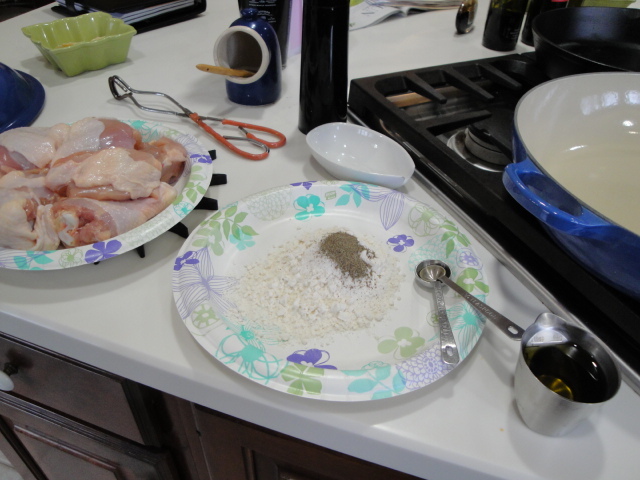 The chicken pieces get dredged in the flour, salt and pepper mixture and then into a large pan with the olive oil. If you don’t have a pan large enough to brown all of the chicken in an even layer with a little space between each piece, do it in batches. After the chicken is nicely browned on all sides but not cooked through, remove it from the pan and spoon off the excess fat. Take care to leave all the little brown bits of flavor! 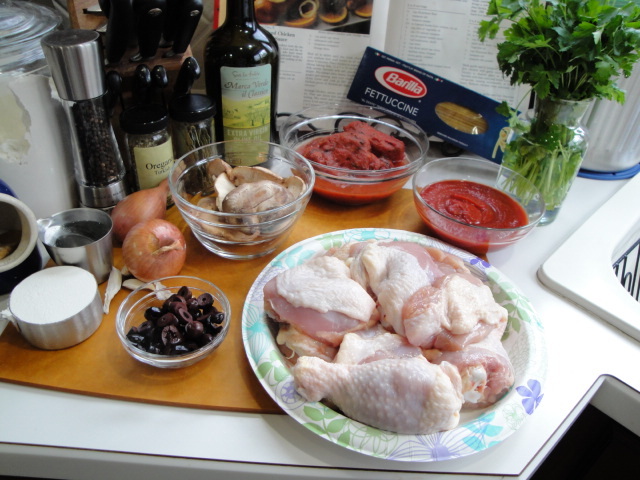 Add the chicken back to the pan and top with the all the remaining ingredients except the parsley. Cover and simmer for around 30 minutes or until all of the chicken pieces are cooked through. 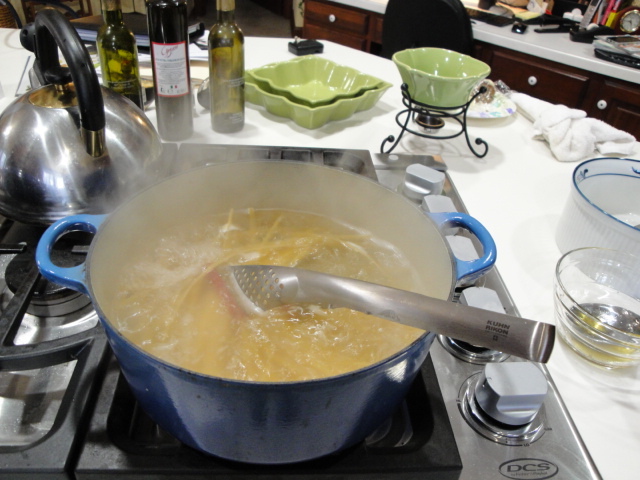 When the chicken is almost done, cook some long pasta. 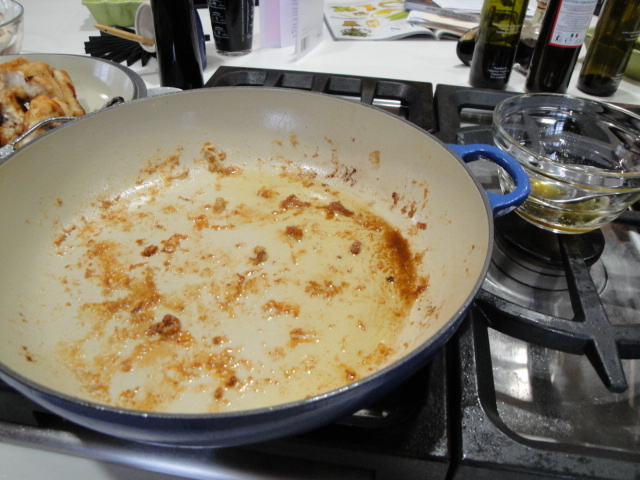 Remember that excess olive oil and chicken fat you removed from the pan? Use a bit of that to toss with the cooked pasta-it’s loaded with great flavor. 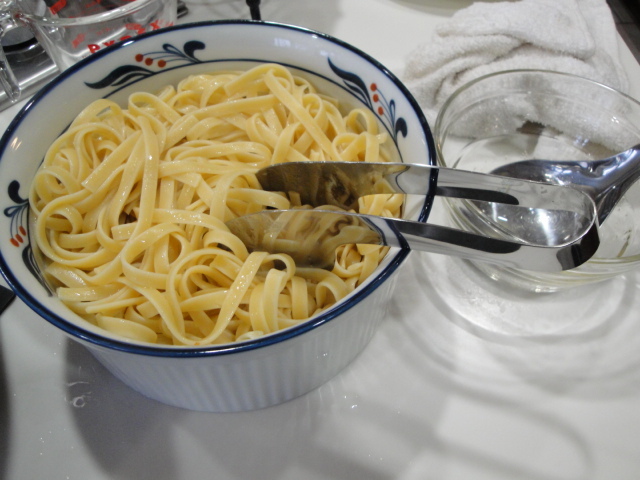 Remember, this is a sometimes dish, you can go for just olive oil for the everyday food. 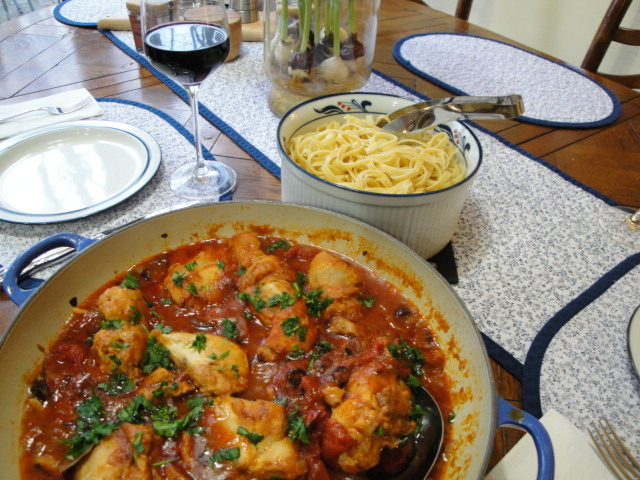 Sprinkle the chicken with some chopped fresh parsley and pour some light red wine. So saucy and flavorful, no wonder it’s made it’s way to my table for over three decades!! Mix flour, salt and pepper. Coat chicken with flour mixture. 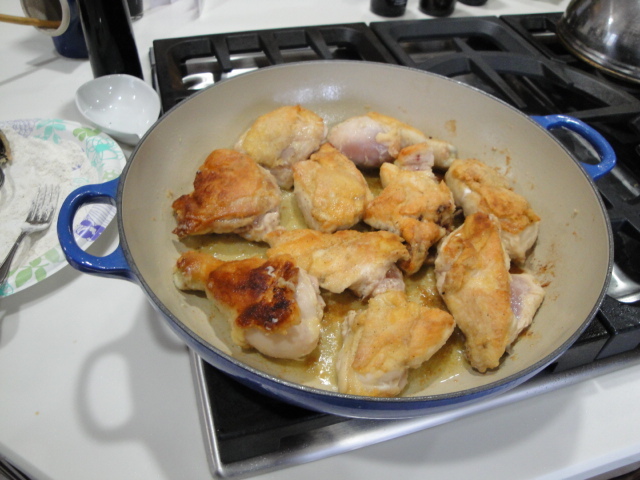 Heat oil in 12-inch skillet or Dutch oven until hot. Cook chicken over medium heat until brown on all sides, about 15 minutes. Drain fat from skillet. 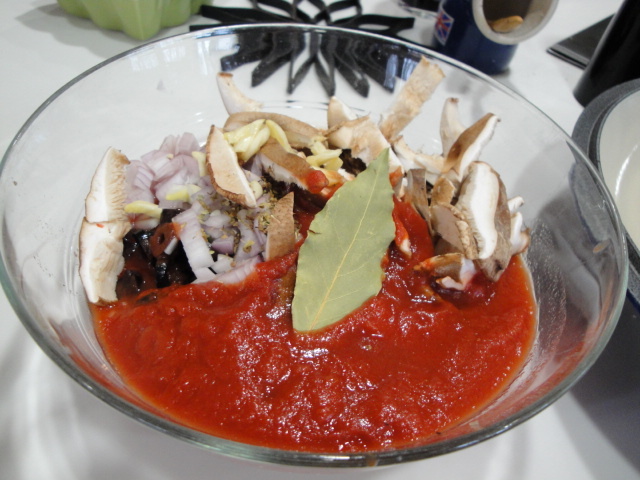 Mix tomatoes, tomato sauce, mushrooms, water, olives, onion, garlic, salt, oregano, pepper and the bay leaf; break up tomatoes with fork. Pour over chicken. Heat to boiling, reduce heat. 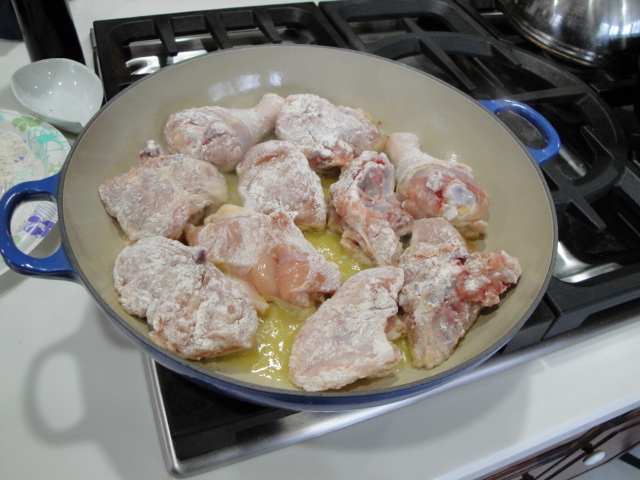 Cover and simmer until thickest pieces of chicken are done, about 30 minutes. 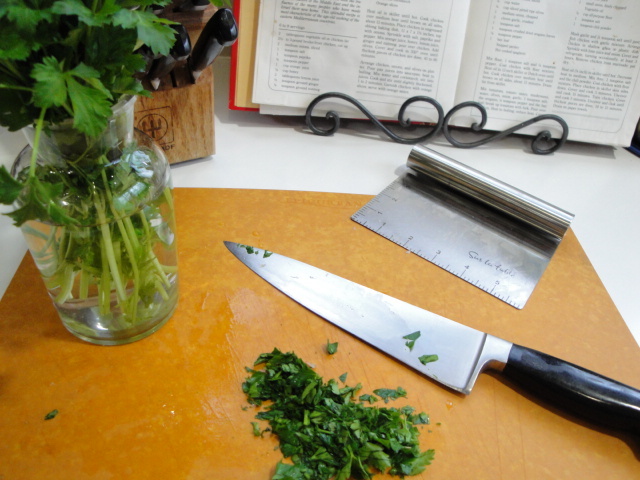 Sprinkle with parsley; serve with spaghetti. * the only thing to note is that there has been a bit of slippage in can volumes between 1980 and now. 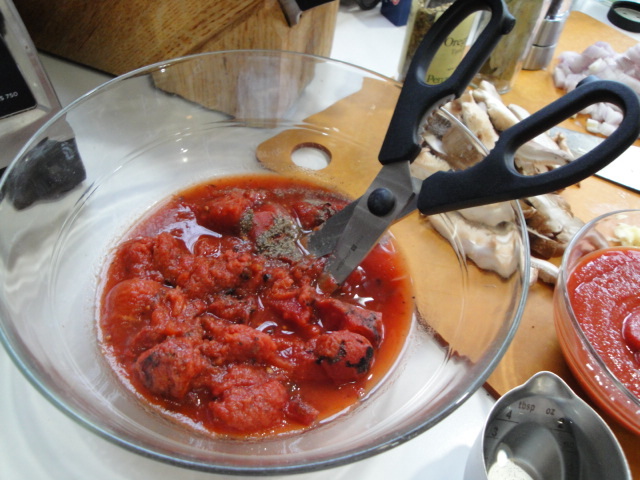 The original recipe uses 1 can (16 ounces) tomatoes which have become a 14.5 ounce can!! In this case I actually weighed the 16 ounces from a 28 ounce can so I could be precise-but normally I would simply throw in the entire 28 ounces.